Animal Defenders International : Publications : Orlandito to go wild! In what could be one of our most exciting rescues ever, we are currently funding the rehabilitation of Orlandito, a brown capuchin monkey, with the aim of returning him and his four companions to the wild in Colombia! 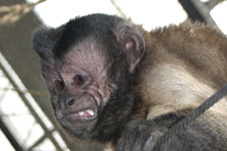 Orlandito was illegally trafficked, then rescued by Colombia’s environmental police and placed in the Unity Rescue and Rehabilitation of Wild Animals Centre, (URRAS) in Bogotá. Here he lived with three other capuchins who, after three years of rehabilitation, were reintroduced to the wild. But poor Orlandito missed out because of rivalry between himself and another male in the group. Orlandito needed his own group – and soon, they started to arrive. ‘Jivi’, a female found abandoned in a bag in a street in Bogotá; ‘Meeku’ and ‘Sibroa’, two young females confiscated after being sold as pets; another female, ‘Taikure’, was to join them but tragically never made it; ill health and injuries took their toll and she passed away. Now Orlandito is the male in a new group with the three females. They will be leaving the rudimentary pen in Bogotá and heading to a remote location in the warmer state of Meta, where we are funding the construction of a large enclosure. They will experience the smells, sounds, and natural vegetation of the area. They will be monitored as they adapt again to the world from which they were snatched. Finally, when ready, the enclosure door will open and the primates will take their first steps to freedom. We may fit Orlandito with a radio collar so that we can monitor the group’s progress and ensure they are safe. As well as what we hope will be the first step for freedom for these animals, our new facility will be used for other rescued animals in Colombia in future. This is an incredibly exciting project and we do hope that you will consider sending a donation to support it. Better still, join our adoption scheme with a regular contribution and follow the progress of Orlandito and friends.